Author of this page will appreciate comments, corrections and imagery related to the subject. Please contact Anatoly Zak. 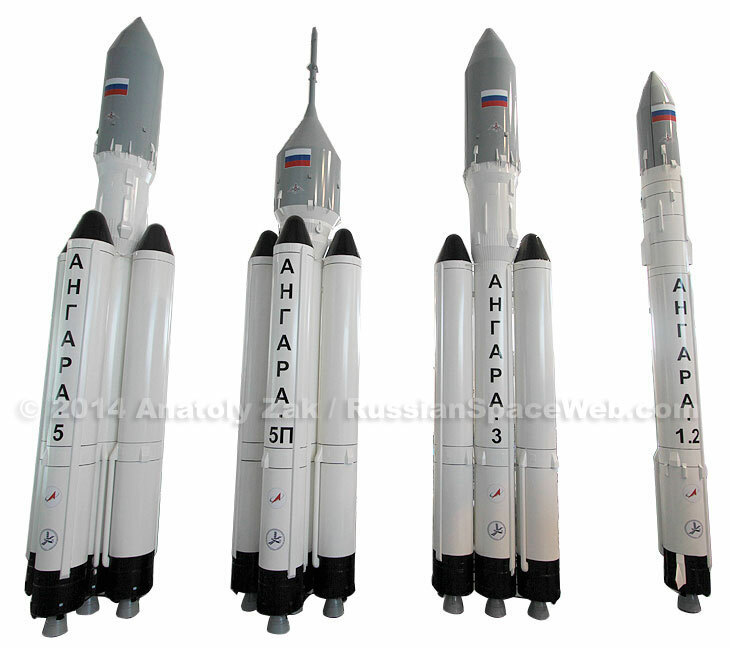 Angara family as of 2013, left to right: Angara-5, Angara-5P, Angara-3, Angara-1.2. In 1992, in the wake of the collapse of the Soviet Union, the Russian government called for the creation of the new space booster, which would be built and launched within the Russian Federation, ending the country's dependency on the hardware and launch sites of the newly independent republics of the former USSR. Despite the strategic importance of the Angara project, it remained on the drawing board for most of the 1990s. The active development of the rocket and of its launch pad in Plesetsk started picking up pace only by the mid-2000s. However, even with improved funding, numerous technical and organizational problems plagued the work. In November 2013, a full-scale prototype of the Angara launch vehicle finally made it to the launch pad at Russia's northern launch site in Plesetsk. It was a major milestone in the long-delayed development of the vehicle then scheduled to make its maiden flight in May 2014. Following an aborted launch attempt on June 27, 2014, a custom-built Angara-1.2PP test rocket completed a successful suborbital mission on July 9, 2014. At the beginning of 2014, the first launch of the Angara-5 rocket was officially promised before the end of the year. In the second half of the year, the rocket was assembled and rolled out to the launch pad for a series of tests. On Dec. 23, 2014, at 08:57 Moscow Time, Angara-A5 blasted off from a snow-buried launch pad at Site 35 in Plesetsk in the north of Russia on its maiden voyage. The nine-hour test flight to the geostationary orbit with a dummy satellite was deemed a complete success. Tentatively expected in 2016, the second test launch of the Angara-A5 will carry the rocket's first operational payload. The Angosat communications satellite build by Russian firm RKK Energia for the government of Angola became the rocket's first customer. In 2016, Russia's new-generation Angara rocket came one step closer to becoming an operational vehicle with the completion of major renovations at its future serial production line in Siberia. By the beginning of the 2020s, the state-of-the-art factory in the city of Omsk should take over the entire manufacturing process for the Angara, churning up as many as 100 booster stages a year. The Angara-1 would be the lightest vehicle in the Angara family. In turn, several variations of Angara-1 were considered during the development, however currently only one configuration is scheduled to fly operational missions. Angara-3 would use a pair of standard URM-1 boosters as the first stage and a very similar second-stage booster. The URM-2 stage would serve as the third stage, enabling the rocket to deliver up to 15 tons to the low Earth orbit. Despite its feasibility, this version was not scheduled to fly as of 2014. Angara-5 would use four standard URM-1 boosters as the first stage and a single URM-1 as its second stage. The URM-2 would serve as the third stage, enabling the rocket to deliver up to 25 tons to the low Earth orbit. Angara-5 was expected to be the main workhorse of the Russian space program, replacing the veteran Proton rocket. A modified version of the Angara-5 designed to carry manned spacecraft became known as Angara-5P. It is officially scheduled to lift off for the first time from the Vostochny cosmodrome in 2018. In 2017, Russian space officials identified another version of the Angara-5 rocket, designated Angara-5M, which was intended to address the latest obstacles on the way of the new-generation rocket family to the commercial market. In one of the major steps to upgrade the Angara-5 rocket, its initial Briz-M upper stage would be replaced with a KVTK space tug, burning cryogenically cooled liquid oxygen oxidizer and liquid hydrogen fuel. In a strange historical irony, a space tug inherited from the Soviet lunar program found its way right to the top of Russia's 21st century rocket. It also made two old rivals in the Russian space industry cooperate again. A proposed Angara-7 would use six standard URM-1 boosters and custom-built core stage, delivering up to 35 tons of payload to low Earth orbit. The project did not go beyond paper studies and scale models. In March 2015, Roskosmos approved a preliminary proposal for the Angara-A5V rocket, as an alternative to a costly super-heavy launcher. Angara-A5V would also replace the proposed Angara-7, which had to rely on a larger-caliber central booster thus making it incompatible with standard launch pads of the Angara family. A new launch-vehicle proposed at GKNPTs Khrunichev in 2005 was designated Angara-100, denoting its ability to deliver a 100-ton payload into the low Earth orbit. It has never been built, but provided a foundation for later studies of super-heavy rockets in Russia. In March 2002, GKNPTs Khrunichev started negotiations with South-Korean representatives on the joint development of the first launch vehicle for Korean Aerospace Research Institute, KARI. in 2009, the Korean Satellite Launch Vehicle, or KSLV, lifted off for the first time using a Russian-built first stage based on the Angara's design. During its first test launch, Angara-A5 is expected to demonstrate its ability to deliver cargo into geostationary orbit 36,000 kilometers above the Equator, the destination for most communications satellites. However, the maiden mission will only carry a payload simulator, rather than an operational spacecraft. The first stage and second stage of the Angara launch vehicle is known as URM-1, which stands for the Universal Rocket Module No. 1. The URM-1 standard module serves as the first-stage booster for all versions of the Angara family of space launchers. The third stage of the Angara launch vehicle is known as URM-2, which stands for Universal Rocket Module No. 2. According to original plans, URM-2 stage was supposed to be used on both types of the Angara launch vehicle approved for development -- Angara-1 and Angara-5. For the first time since the mighty Energia rocket flew its final mission in 1988, a new Russian booster propelled by hydrogen will take to the sky onboard the Angara-5V rocket in the first half of 2020s. Provisionally known as URM-2V, it will serve as the third stage of the four-stage Angara-5V. Although the first stage boosters of the Angara rocket would be fueled by the traditional combination of liquid oxygen and kerosene, Russian engineers promised to equip the upper stages of the rocket with engines burning two cryogenicaly cooled components -- liquid oxygen and liquid hydrogen. In cooperation with KB Salyut, the developer of the Buran orbiter, Khrunichev conceived a reusable flyback booster rocket, which could serve as an alternative first stage in the Angara family. Designated Baikal, after a Siberian lake, the reusable booster was developed in parallel with the work on more traditional "booster modules." Designed to launch on the Angara-5V rocket, the MOB-1 space tug (a.k.a. MOB KVTK) will be a beefed up version of the standard KVTK stage, but customized to boost the manned PTK spacecraft and the lunar module from the Earth orbit toward the Moon in the second half of the 2020s. To deliver communications satellites and other payloads into the hard-to-reach geostationary orbit 36,000 kilometers away from Earth, Angara-3 and Angara-5 rockets could be equipped with a Briz-M upper stage borrowed without much change from the Proton-M rocket. The first-stage boosters of the Angara rocket are powered by the RD-191 engine built at NPO Energomash in Moscow. Equipped with a single combustion chamber, the RD-191 is derived from the four-chamber RD-170 engine developed during the 1980s. Originally developed for the third stage of the Soyuz-2 rocket, a modified version of the RD-0124 engine, designated RD-0124A was customized for the URM-2 stage of the Angara rocket. Final tests of the engine took place in the summer of 2013 clearing it for flight on the first Angara rocket. In 1997, the KBKhA design bureau in Voronezh started work on an engine with a thrust of 10 tons and equipped with a nozzle extension for best performance at high altitude. The engine would be intended for the KVRB upper stage, which one day could fly on Angara rockets. From the outset of the program, the Russian military intended to build the primary launch complex for the Angara rocket in Plesetsk, at the site originally intended for the Zenit rocket but abandoned after Zenit production was left in the newly independent republic of Ukraine. In 2004, Russia and Kazakhstan reached an agreement to build a launch complex for the heavy version of the Angara rocket in Baikonur. However after years of planning, the two sides have never been able to agree on terms for the implementation of the project. Provisional plans to launch Angara from the Svobodny Cosmodrome in the Russian Far East were made in 1994 but had to be put on hold for almost two decades. Only in 2011, did Roskosmos revisit the idea of bringing Angara to what became the Vostochny cosmodrome. Deploying Angara in Vostochny would make the Baiterek pad in Kazakhstan unnecessary.